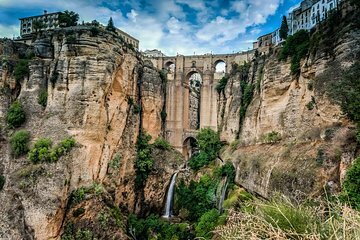 From ancient Roman roots to Moorish rule and Andalusian bullfights, discover the long and fascinating history of Ronda on this private, 3-hour walking tour. Stroll through the old town center and across the dramatic bridges that cross the Tajo Canyon with a guide, stopping at the city’s most interesting landmarks along the way. Connect with your official tour guide at your city center hotel or another designated meeting point, and set off on a walk through the historic heart of Ronda. As you stroll, learn about the town’s long history, beginning with its founding as a fortified Roman post. See evidence of Ronda’s era of Moorish rule at the Arab baths, considered among the best preserved in Europe. Pass by the old town hall, and imagine scenes from the golden age of bullfighting at the Corrida Goyesca, one of Spain’s oldest and largest bullrings. For dramatic and dizzying views, peer far down into the Tajo Canyon from three bridges — the Puente Romano, Puente Viejo, and Puente Nuevo. If there’s anything else in particular you’d like to see or do, your guide can customize the morning’s itinerary. The 3-hour tour finishes back at your hotel or other starting point.